My love of beauty potions and lotions and makeup knows no end. But I try, I really do try, to make as much of my routine as green as possible. In the last decade, even more so in the last five years, we’ve seen eco-beauty become as luxe as the rest. 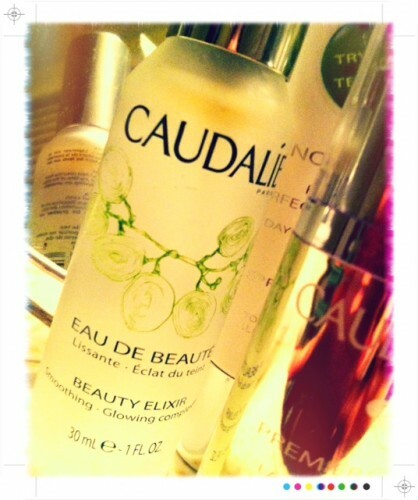 The French skincare line Caudalie began about 15 years ago, and I know both Sarah and I have been fans for some time. But I was thrilled when the girls at Caudalie contacted me the other day to announce that they’d just revamped their US site, and wanted to celebrate with our readers. With all the research and development that goes into her products, Mathilde particularly loves the eye cream, Premier Cru ($95/15ml) – which I’ve just started to use. It’s formulated to nourish and hydrate while fighting puffiness, dark circles and signs of aging. But what I especially love is that the cream has a luminescent quality, so that while it may take some time to see results, you instantly look refreshed – I’m skipping my usual undereye concealer. Two other products I received were favorites with other members of the Caudalie team, and it’s no surprise why. The Beauty Elixir ($16/30ml) works with all skin types, all day. Use it before moisturizing, through the day as a toner or spritz lightly over your makeup to help it set (a makeup artist trick of the trade). The ingredients include grape and rose extracts, essential oils of rosemary, mint and myrrh, and orange flower water. The Vinoperfect line is what made them famous – their Radiance Serum is “the number one choice for radiance and anti-dark spot treatment” found in French pharmacies. And the new Day Perfecting Fluid ($68/30ml) is fantastic. It moisturizes and protects with an SPF 15 (with UVA and UVB coverage), but it also evens skin tone like a primer. The oil free cream contains grape and olive extracts, cypress, sweet and mandarin oranges, chamomile and mint – it smells amazing. While you’re there, check out some of the new features, including Mathilde’s blog, the ability to get live help from Caudalie experts, and three deluxe samples with every order. They’re also adding a section for reader reviews and comments, which I think is a fabulous resource. Although the discount does not apply in store, you can find Caudalie products sold at Sephora, select Nordstrom stores, and at boutiques near you. xo a.